Charlotte, NC is home to some of the most beautiful scenic views in the country, and no one should go a lifetime without stopping to see the amazing sights, both manmade and natural. Once you come to visit, you’ll want to set up shop and never leave again. At Charlotte’s Airport Overlook, you can take in the view and catch the nation’s 6th busiest airport in action. If catching a baseball is more to your liking, you can grab a hotdog at BB&T Baseball Park and enjoy Charlotte’s stunning skyline. For a bite to eat, check out Bentley’s on 27 while looking at a panoramic skyline view. If you have a resident friend or colleague that can get you in, the Sky Lounge at The Vue is second-to-none. If you love the outdoors, the US National Whitewater Center can send you on a whitewater adventure, or you can spend your time listening to live music and taking in the scenery. 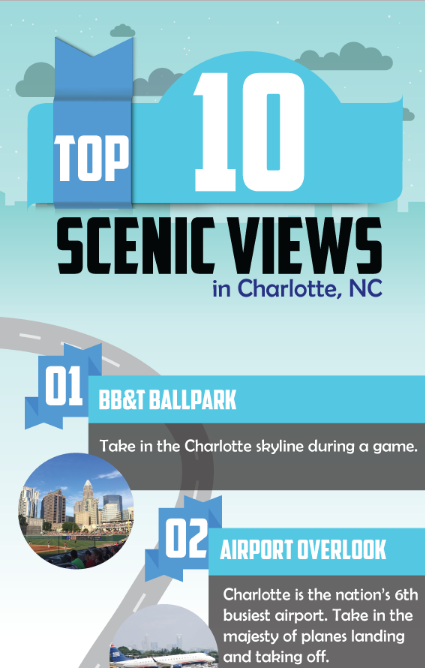 The VUE, a luxury apartment community in Uptown Charlotte, has put together a comprehensive infographic below to help you plan your sightseeing in the area.